Today I played “King for the Day”, joined Alex and Dave for a day of fishing with Captain Justin. Yes, I was out numbered as they are retired Fire Fighters and Dave was actually a Chief, like a real one. Fire Departments have ton’s of Chief’s unlike the Police Department where you have one Chief but Dave was “The Chief”. In all the excitement we finally spot some Tarpon crashing the glass minnows and also rolling. Cast live baits to them and slow troll without success. It was now time for some Snook fishing. The River even on the incoming tide looked like a cesspool. Dave landed one Snook and so did Justin, I caught a nice Catfish. OMG! Then I hook the fish of a lifetime….or so I thought, after twenty minutes of tug o war, in comes a massive stingray. I just can’t win today. Continued to work docks in the River and Alex lands a beautiful Mangrove Snapper, probably eighteen inches. Alex continued on and landed a nice Trout, over twenty inches. The Snook boiled on our baits, grabbed them but today they never really committed and we didn’t catch much more. 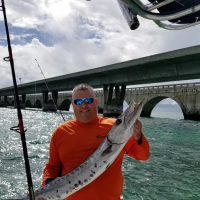 It was great not having to control the boat, run the trolling motor and being able to fish……I have no excuse for not slaying them but I enjoyed the day on the water with Alex, Dave and Captain Justin. Great story. Sorry the fish did not cooperate. Where were you fishing out from? You won't forget that day of fishing anytime soon! St. Lucie Inlet and then the Indian River. That's why I like my Shimano Baitrunners, if you have too much drag those beach holders will let you down... Great report.